I’ve believed over the past few years that the 2014 Sun Stakes night at Pocono Downs was the fastest card in harness racing history. Not necessarily in terms of the quality of horses racing that night, although it was certainly loaded with top quality stock, but because of the weather and track conditions that allowed extraordinarily fast times to be produced race after race. After the exhibition put on at the Red Mile last weekend, that Pocono night has been eclipsed as racing’s fastest card. The highlight from that late June card at Pocono four years ago was the 1:49 mile trotted by Sebastian K, smashing the all-time previous trot mark. Up until that time, no trotter had even broken 1:50 on a two-turn track. And that was just the start. On that night, world records fell with each passing race. In addition to Sebastian K’s mile, Sweet Lou paced the fastest mile ever on a five-eight’s mile track in 1:47. Similarly, Father Patrick put up the fastest ever mile for a 3-year-old trotter for a track that size. There is also a direct link between that Pocono card and last Saturday’s card from the Red Mile, and that connection is through the horse, McWicked. McWicked won the Hempt as a 3-year-old in 1:47.3 which at the time was a record for 3-year-old pacers on a five-eight’s mile track. 73 races had passed between that 2014 mile from McWicked and his 1:46.2 clocking last Saturday in the Allerage Farms and in that period his fastest win time was 1:48.2, taken during the Mohawk Gold Cup in 2017. The point being that when horses are able to break a certain time barrier once every number of years – and then every other horse on the card does the same – there is something else at play other than the horses themselves. This couldn’t have been made any clearer than the recent October 6 card at the Red Mile, a card that smashed every harness racing norm. The first race was that was a non-descript late closer series carrying an $11,000 purse, where 3-year-old trotting filly Impinktoo went wire to wire in 1:49:4 with a last quarter of :26.3. The 1:49.4 clocking was good for a tie of the fastest trot mile ever by a 3-year-old filly, and the sixth fastest mile ever trotted regardless of age or gender. From 24 prior career races, the fastest mile from Impinktoo was a 1:54 win taken just the prior week. The 1:49.4 win was over a 20-length improvement. Business would only pick up from there. In the next race, 3-year-old pacing filly Double A Mint pounced from a two-hole trip to win in a 1:47.3 blowout. It was the first win of the year for the filly who with a previous mark of 1:52.4 as a 2-year-old, came into the race showing race times consistently in the 1:50-1:52 range. In winning her Tattersalls division, she became the second fastest filly of all time, only behind Shebestingin. From there, the list goes on and on. There were five International Stallion Stake divisions that day for 2-year-old colt pacers, and the winning times from those races were 1:49.3 (Workin Ona Mystery), 1:49.2 (Captain Trevor), 1:49.1 (No Mas Amor), another 1:49.1 (Captain Crunch), and a “slow” time of 1:50.3 (Mangogh). In the case of No Mas Armor, the 1:49.1 was a maiden breaking win for a horse that went off at odds of 114-1 after pacing all his previous races in let’s call it 1:52-1:53-ish. When we add in the 1:48.3 mile by 2-year-old filly Warrawee Ubeaut from the day before, the top 20 fastest two-year-old pacers in the history of the sport has five new editions over the course of a day. These times while suddenly commonplace, are still mind boggling. I’m sure these are all very fine 2-year-olds, but to put these times in perspective even Captaintreacherous only went 1:49.2 as a freshman while his sire Somebeachsomewhere posted a 2-year-old best of 1:49.3. Perhaps the best example from the card to drive home this card being the fastest ever was from a trotting mare named The Erm. A 4-year-old who was 1 for 17 on the year with a career mark of 1:54.3 through 43 lifetime starts, she bottomed out her late-closing series foes with a romp in 1:50.3. She was race timed at the Red Mile the prior week in 1:55, and is now tied in the record books at 1:50.3 with the likes of Daylon Miracle, Sevruga, Uncle Peter, Will Take Charge, Market Share, Mystical Sunshine and Obrigado. Of course, the record that will make the day stand out in history was Homicide Hunter trotting in 1:48.4. To break the record from Sebastian K may have once seemed implausible unless it was by a one-for-the-ages type of trotter, but it doesn’t appear to be that much of a stretch when considering 3-year-old trotting fillies are going in 1:49. Suspect that maybe there was a teletimer malfunction and that the times were consistently off all day, I went back and hand timed each race from that day. In every case, the race time was proven essentially to be accurate. When abnormally fast times became consistent at Pocono a few years back there were calls to remeasure the track, thinking that it must have been a few yards shorter than a complete mile. This couldn’t have been the case at the Red Mile either as race times from the two days leading up to Saturday’s card were fast but didn’t seem to be completely unreasonable. 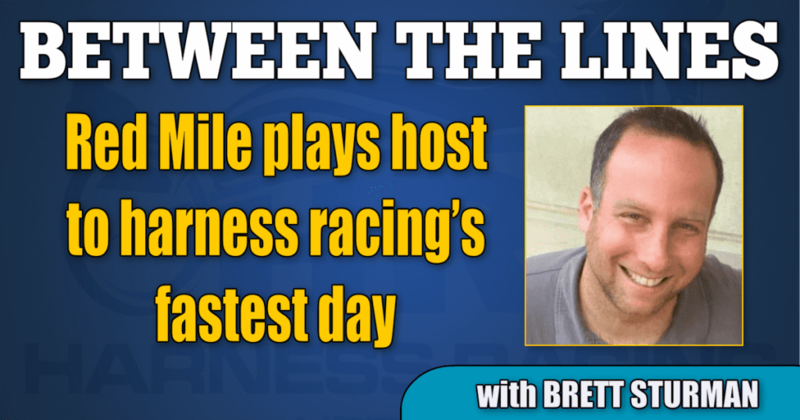 The times produced at the Red Mile on Saturday and to a slightly lesser extent on Sunday weren’t the result of anything other than favorable environment conditions and track conditions that have been notorious in always making the Red Mile the fastest track in the sport. The card that saw these performances and records should be considered the fastest day in the sports history. Even with the rate that records come and go these days, this was a day that will not be replicated for some time.